"This was awesome! Excellent event and great location. After winning 5men in Bitburg in 2010, stepping up to Div2 was a huge challenge for us. We want to thank our trainer Philipp Fischer and also MAXS Austria and MacDev for supporting us. Please show them some love and check our facebook at www.facebook.com/TeamRMG or our website www.teamrmg.eu." Attention: the Bitburg event is NOT at the same location like previous years (airport). We are about 200m down from the hotel Eifelstern at the stadium of the Sportschule Bitburg. THE MILLENNIUM SERIES - MAXS European Masters 2011 from Claude Sagné on Vimeo. "Our first Millennium together was a real success for our team. We won all the games and did not expect such nice results! We will keep going on training together because team spirit was the key for us. 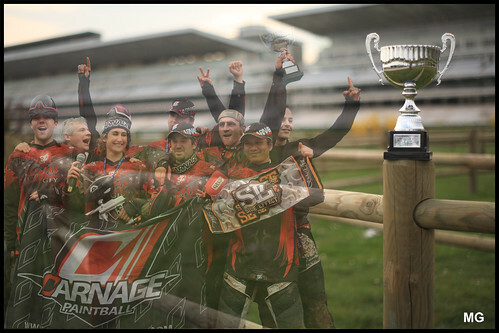 Thank you to our sponsors; Carnage Paintball for the best paint ever, Side Effect for their ultimate jerseys and aftergame, and Camp Paintball shop for their support".